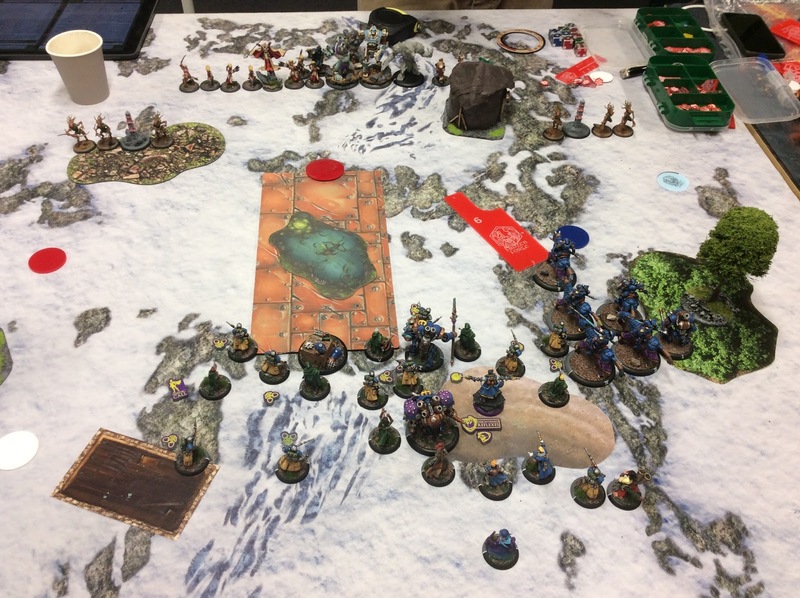 Jonas' other list in his pair is currently Kreuger1, and he was wondering if that one or Una2 (battle report here) was the best drop into Caine2. I haven't played Krueger1 for many years, going to be interesting to see how he has changed in Mk3! I win the die roll and decide to go first. Kreuger wants the Rough. Again I want Caine2 on that sweet hill. Keruger has so much stuff that ignores Stealth that I decide to give the Rangers tough, for the first time ever. Caine2 takes Bullet Dodger and the Trenchers get Heightened Reflexes. The Sentry Stone was directly across from the Hunter so I take a pot shot, but only 6 boxes. 50% chance! Arcane Shielded storm Lances feel fairly safe from Sentry Stone Sprays so they just move far up. Kreuger cast Gale Winds this turn, and he keeps on doing this every turn. That -3 to hit is very strong against my guns, and definitely makes stuff much harder for me all game long. Both the Wayfarers get too close. Caine2 pops up, shoots one, then ports back. 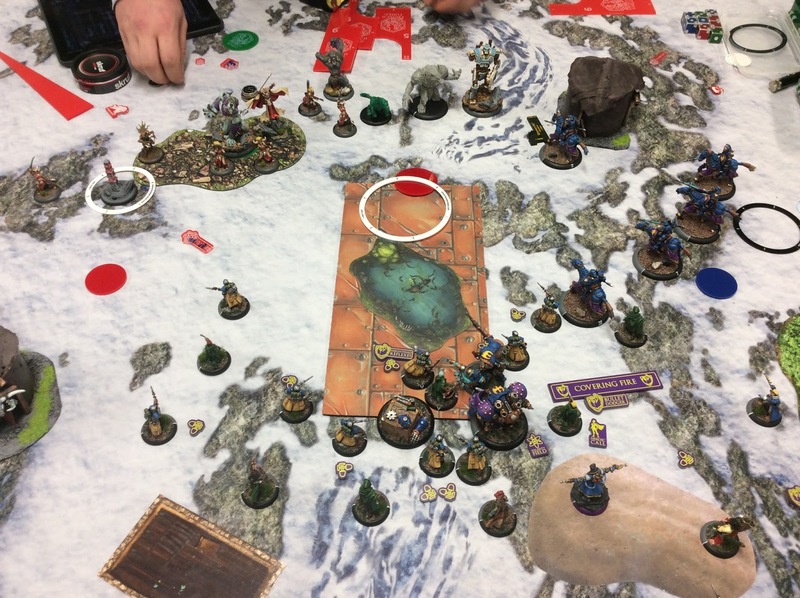 The Hunter just had space to get into range of the stealthed Sentry Stone and shoots it away. 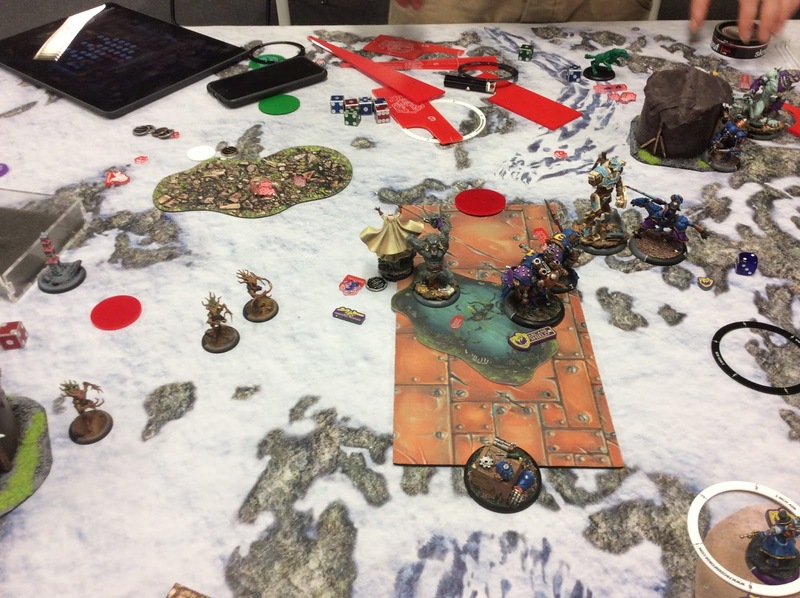 A lance was barely within range of the other Wayfarer, and charges and kills him. The rest spread out so that not all will get sprayed. Again I forgot to take a picture, what is going on? I am barely too close to the Bloodweavers and a some infantry gets pacmanned. Totally pointless, I could have stayed 1" further back end been safe. 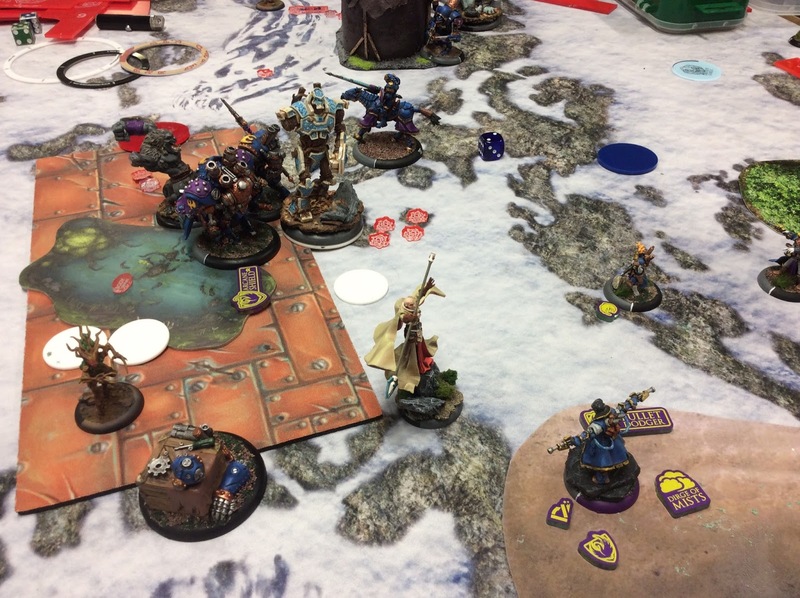 Pureblood sprays also remove a lot of stuff and the Argus runs in to jam my cavalry. Ragman goes up and tags the right side Pureblood through the Centurion. 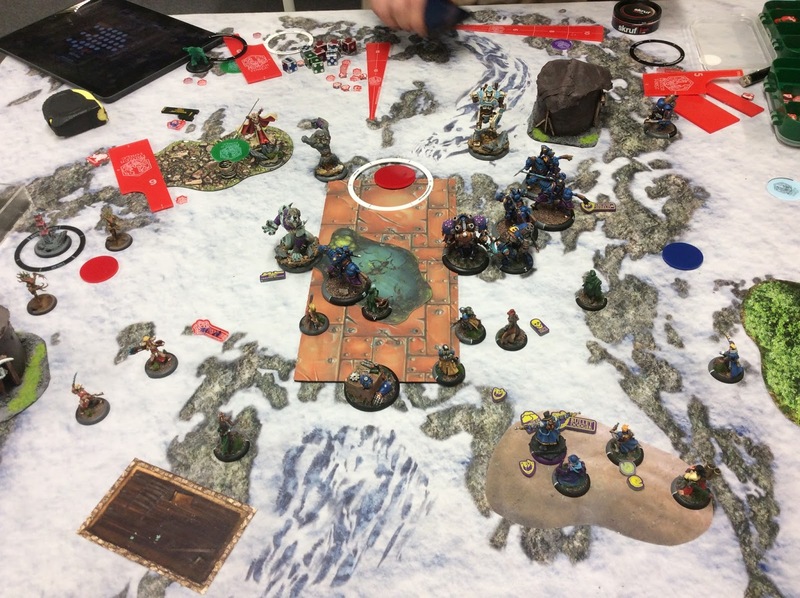 Caine2 feats and shoots away the Argus and takes out the body on the left side Pureblood. the Storm Lances clear out the right side Pureblood. Megalith and Gorax kill most of the Lances. Kreuger feats and most of the remaining infantry dies. Losses have been heavy for both sides, what a grind! The Centurion cleans out the other Pureblood. I did not notice his Throw play here, I could probably have stopped it by moving the Lance a little. I could of course have avoided all of this by watching the throw threat ranges and placing some blocking pieces. This was a intense and hard fought game, I really enjoyed it. 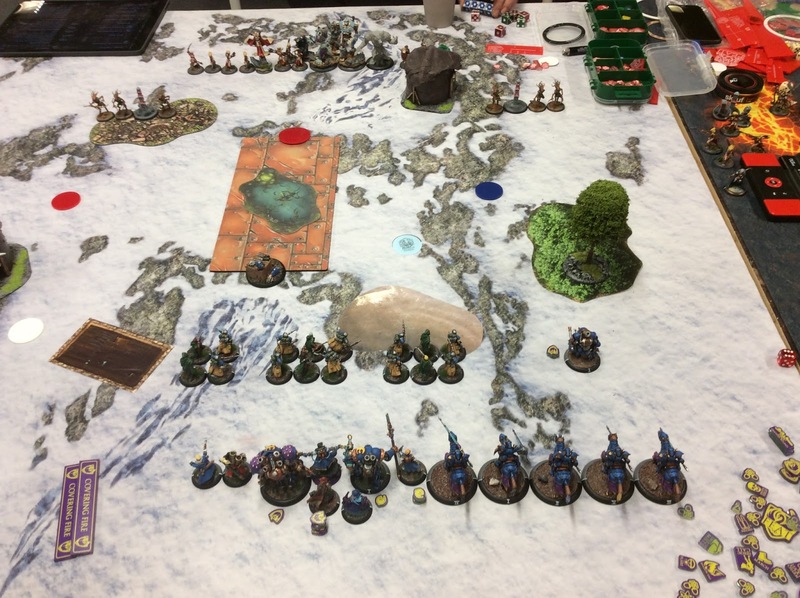 Two fairly evenly matched armies, and plenty of carnage. Overall we both think Krueger probably has a better game than Una2 into Caine2, which was what we were trying to figure out! Remember the mantra. HR goes on Caine, HR goes on Caine, HR goes on Caine. I am not sure that I agree. I think it's better if I die a bunch of times to this, and actually learn how to avoid the throw combos, rather than gimp my army by not giving it to the Trenchers. If I meet a list that is based on Throw/KD shenanigans, like Rahn or Rask, then sure, it's HR every single time! But against his list, I think it should be mostly avoidable if I am careful with the threat ranges.